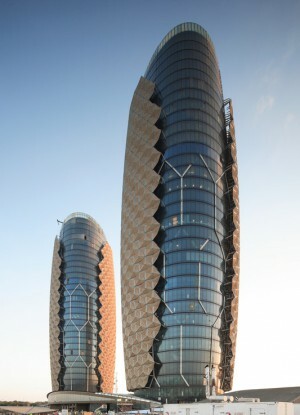 In designing the two towers, the approach considered the renewed interest in energy efficiency in Abu Dhabi, as well as the desire to use modern technology to meet their goals. A circular form was proposed for its efficiency of wall-to-floor area and reduced amount of surface area, which was then refined iteratively to get the final form. The towers taper at the top and bottom and widen toward the middle, and was generated from a pre-rationalized geometry derived from the Islamic composition. This process was undertaken by means of parametric and algorithmic computer studies. 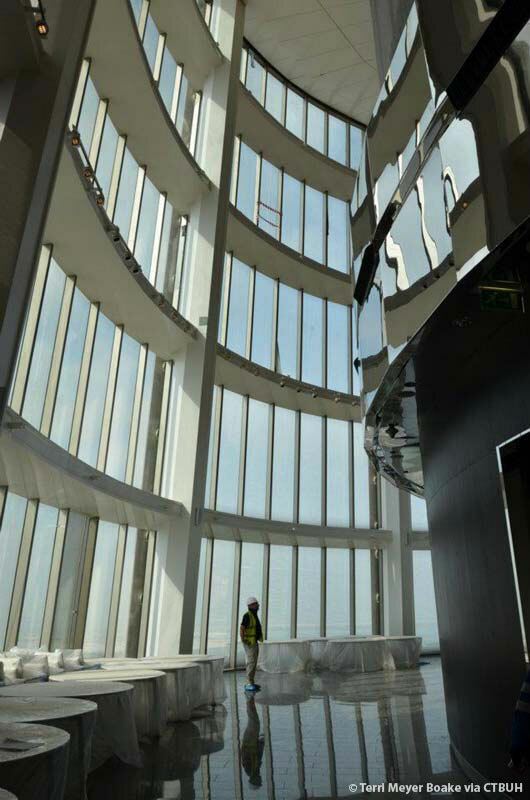 To fully combat the effects of solar glare and heat gain, the team looked for a method to shield the glazed towers in a unique and creative way. 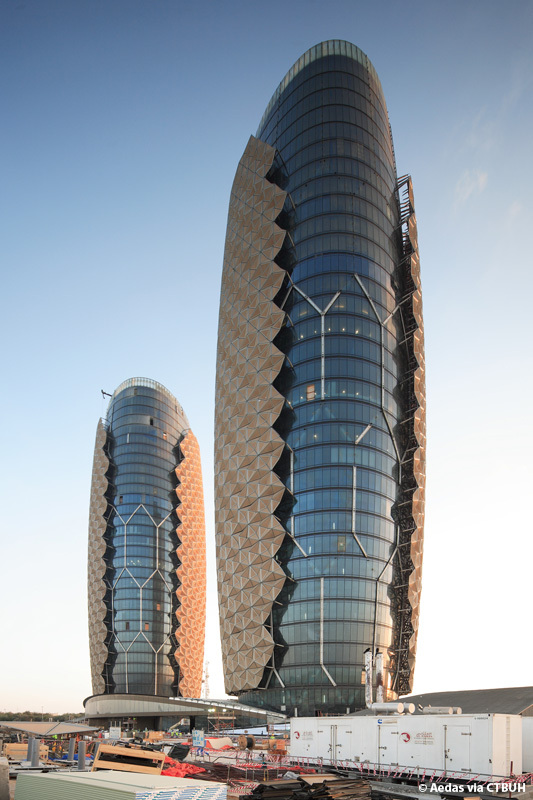 By studying the traditional and vernacular architecture of the area, the “mashrabiya,” a wooden lattice screen used predominantly in Islamic architecture, became the inspiration for the towers’ active skin. 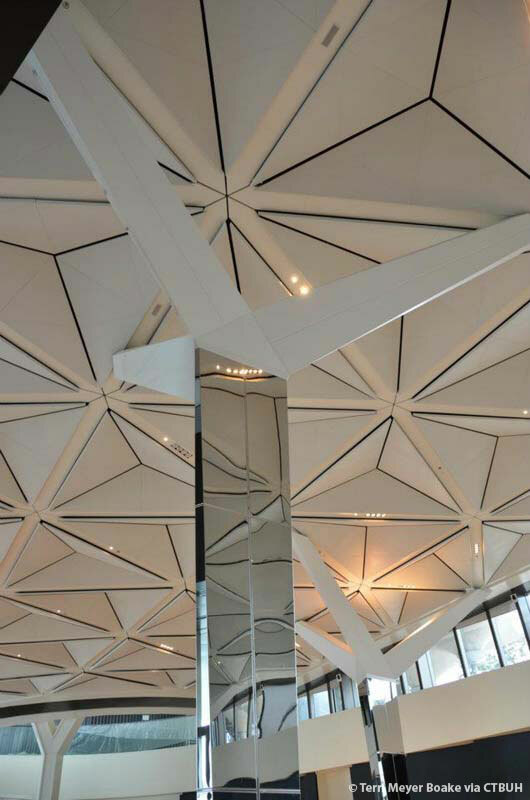 The façade’s moveable components are semi-transparent PTFE (polytetrafluoroethylene) panels, which are combined in arrays much like umbrellas. 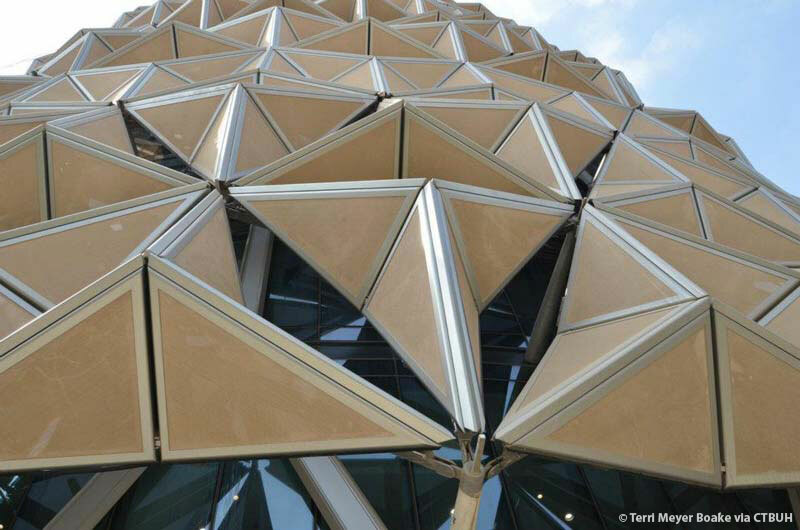 Each array opens and closes in direct reaction to the sun’s position, allowing indirect sunlight to enter the building while blocking the strongest rays to prevent glare and heat gain. 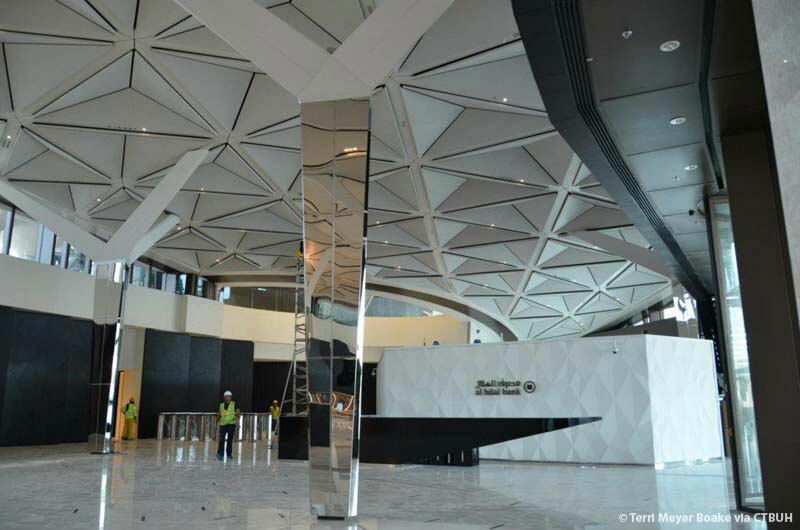 While the system improves the comfort and light in the spaces inside, it also reduces the need for artificial lighting and overall cooling loads. This innovative external shading system is also being recognized as the inaugural winner of the CTBUH “Innovation” award. 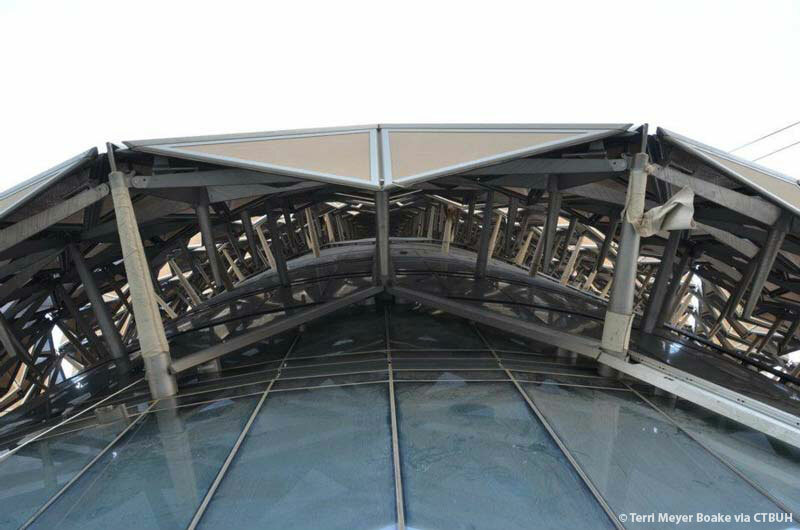 Internal sky gardens exist along the southern façade of the building which, in addition to the exterior shading, help alleviate the effects of solar exposure. 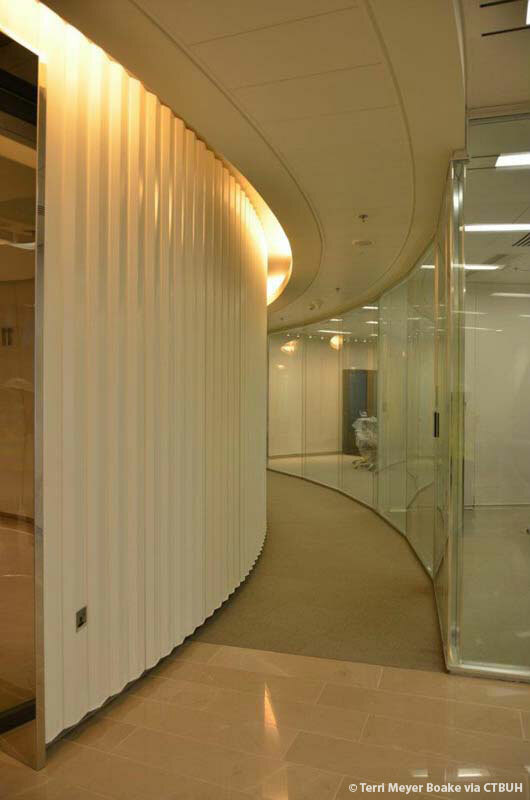 These areas also serve as an amenity to users, who utilize the spaces for meetings or breaks. The façade system challenges the typical high-rise typology of the area, suggesting that more responsive and dynamic solutions to climactic conditions are more appropriate than attempting to statically handle them through designs based on non-regional traditions. 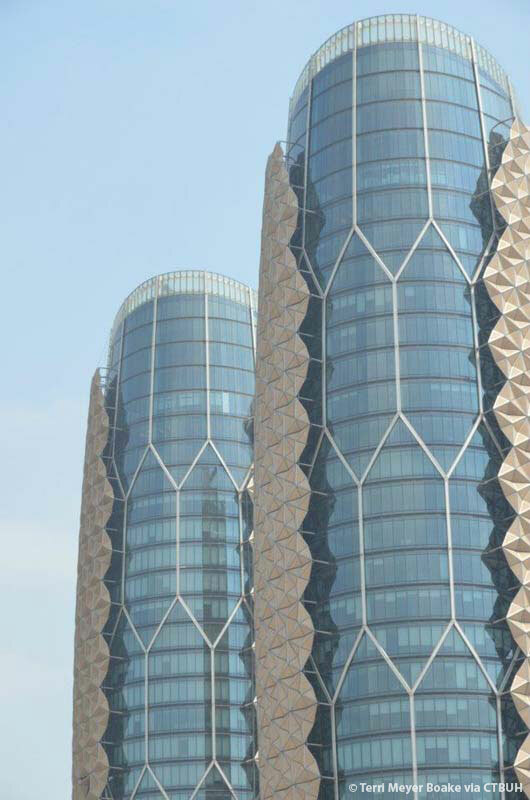 Al Bahar Towers seeks to provide both a contextual and culturally sensitive design while also utilizing modern technology to meet higher standards of efficiency. 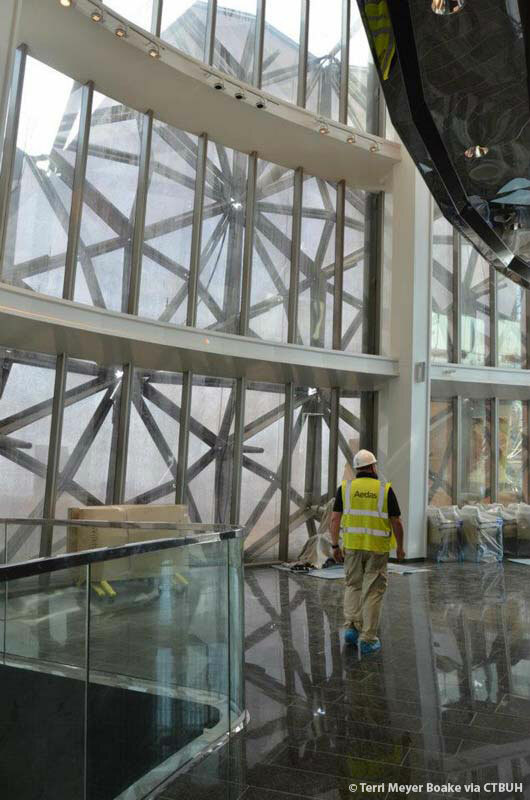 The podium accommodates a range of shared facilities including prayer rooms, restaurants, and an auditorium, while enabling segregated access to be achieved for various categories of users including members of the public, staff, and VIPs who are provided with discreet access from the upper landscaped deck. There are two levels of basement parking and a mezzanine area is provided within the podium as a meeting point for staff. 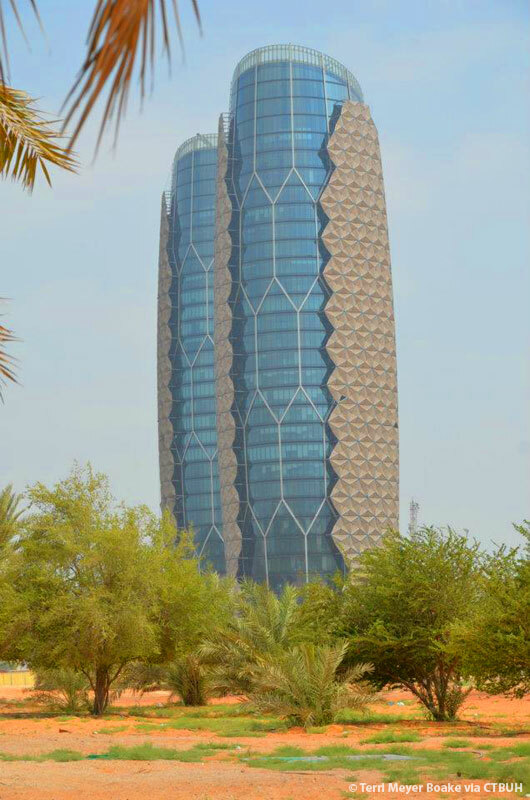 The design of Al Bahar Towers may also be seen as a response to a number of other initiatives that were being launched within the Emirate at the time of their conception, including publication of the Abu Dhabi 2030 Plan, comprising a comprehensive development framework based upon the principles of cultural and environmental responsibility, together with development of the Estidama environmental management standard and promotion of the Masdar initiative on renewable energy.